Background: As per WHO, it is important to measure quality of life indictors along with the clinical disease measurement. Objective: The objective of this study is to evaluate the impact of different levels of caries experience on the quality of life of preschool children and their families assessed using the Marathi Early Childhood Oral Health Impact Scale (ECOHIS). Materials and Methods: The Marathi version of ECOHIS was developed through a standard translation and back translation procedure. 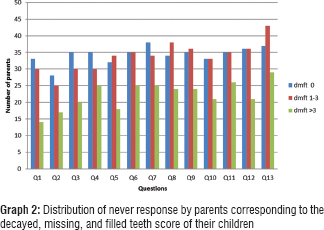 A total of 145 preschool children underwent an oral examination, and their caries experience was recorded (decayed, missing, and filled teeth [dmft]) and their parents filled the Marathi ECOHIS questionnaire. The overall ECOHIS score was calculated for each child. Based on the dmft scores, three groups were made (0, 1–3, >3). Impact was assessed by comparing the mean Marathi ECOHIS scores of the three dmft groups using Kruskal–Wallis test with post hoc analysis at 5% level of significance. Results: The overall prevalence of dental caries in the present study was 73.10%. Mean dmft was 3.16 ± 3.61. The overall child impact ECOHIS score was 7.54 ± 8.40, and family impact score was 2.50 ± 3.33. The child impact and family impact ECOHIS score significantly differed in the three dmft groups (P < 0.001). Children with dmft >0, significantly had higher child impact and family impact score as compared to those with dmft = 0. However, there was no difference in the scores between dmft 1 and 3 and dmft >3. Conclusion: This study showed that the Marathi ECOHIS significantly discriminates amongst children with and without caries but does not differentiate between children with lower dmft (1–3) and higher dmft (>3) levels. The quality of a life of an individual determines the quality of his health. Dental caries is a multifactorial disease of great public health significance. The new concept of health declared by the WHO particularly the aspects of mental and social well-being were not entirely captured by the clinical indicators of oral diseases such as dental caries or periodontal diseases. This has created a demand for new health status measures, in contrast to clinical measures of disease status. As a result, researchers started to develop different measures that would evaluate the physical, psychological, and societal impact of oral conditions on an individual. Standardized questionnaires are considered as the alternative measures. Instrument development in the area of oral health-related quality of life (OHRQL) primarily focused on adult and geriatric populations. In recent years, several instruments have emerged which improve and validate oral health-related quality of life (OHRQoL) in children and adolescents., The assessment of the quality of life has become a fundamental part in the health program evaluation. Preschool children may suffer from a number of oral health problems such as teething pain, eruption disturbances, early childhood caries, and dental trauma. A dental survey conducted among the Brazilian preschool children reported that nearly 27% of children between 18 and 36 months of age have at least one primary tooth with caries and this proportion rises to nearly 60% among 5-year-old., Measuring OHRQoL can make a noteworthy contribution by providing additional data on this issue to help guide oral health policies and thereby contribute to the definition and prioritization of the socially appropriate use of resources. Various tools were developed to measure the OHRQoL of school children such as Self-reported scale of Oral Health Outcomes, Child Oral Health Impact Profile, Child Perception Questionnaire, Early Childhood Oral Health Impact Scale (ECOHIS) etc. Hence, this study was planned to evaluate the ECOHIS in the Indian context using Marathi version. The aim of this study was to evaluate the impact of different levels of caries experience on the quality of life of preschool children and their families assessed using Marathi ECOHIS. A cross-sectional study design was used to conduct the study among the children of 2 preschools. The study was conducted for a period of 6 months (October 2016–March 2017). Census sample was taken. The total sample size of the children was 197. Out of which only 147 knew Marathi and two parents were not willing to participate. Therefore, the final sample for the study was 145. Ethical clearance was obtained from the Institutional Review and Ethical committee (DPU/R&R[D]/99/16). Informed consent was obtained from parents before administration of questionnaire and clinical examination of the children. Three–five-year-old children whose parents permitted their participation and parents/guardians who knew Marathi language and were willing to fill the questionnaire were included in this study. The original English version of ECOHIS was translated into Marathi version by language experts who were well versed in both the languages using forward and backward translation. The questionnaire was face validated by two experts who were proficient in both the languages. A pilot study was also conducted among five people to check, if the Marathi language was simple and that they were able to comprehend the questionnaire. The level of the questionnaire was such that a 7th grade individual could understand it. Caries experience using decayed, missing, and filled teeth (dmft) index of all the preschool children from both the schools was recorded. The clinical examination was conducted in the class-room in the presence of the parent with natural illumination. The Marathi ECOHIS questionnaire was then administered by the investigator to 145 parents of the children from both the preschools. The questionnaire was given to the parents when they had come to drop their kids in the morning and during the parent-teacher meeting. Marathi ECOHIS comprised 13 items which were divided into two domains i.e., child impact section and family impact section which was similar to the original scale. No modifications were undertaken in the questionnaire except that it was in the Marathi language. The response of the questionnaire for the Marathi ECOHIS was coded as: 0 = never; 1 = hardly ever; 2 = occasionally; 3 = often; 4 = very often; 5 = don't know. ECOHIS scores were calculated as a simple sum of the response codes for the child and family sections separately. During calculation of score “don't know” response was not considered in the score calculation; however, the frequency was noted. ECOHIS response scores were calculated from item 1 to 9 for child impact domain and item 10–13 for family impact domain. The scores for child impact were calculated by summation of scores from item 1 to 9 and the scores of family impact were calculated from item 10 to 13. The scores of the child impact domain have a possible range of 0–36 and the score of family impact domain has a possible range of 0–16. Data were analyzed on IBM SPSS Statistics version 21. For the purpose of analysis, three dmft categories were made with category 0 indicating zero dmft, category 1 indicating 1–3 dmft, and category 2 indicating dmft more than 3. The data had nonnormal distribution and hence for the comparison of ECOHIS between the categories nonparametric test (Kruskal–Wallis with post hoc analysis) was used. In the present study, the age of the children ranged from 3 to 5 years, with a mean age of 4.22 ± 0.68 years. Majority of the children were boys 87 (60%) and 58 (40%) were girls. Fathers (53.8%) participation was more than the mothers. Overall, 83.4% were working parents. Overall, the prevalence of dental caries among children in the present study was 73.10%. The mean dmft was 3.16 ± 3.61. Majority of the parents have reported never or hardly ever options for the child impact domain as well as for family impact domain. It was observed that the response for question numbers 4, 6, 7, 8, 9, 11, 12, and 13 was “Never” opted by more than 60% of the parents. The “hardly ever” response was between 0% and 20%. Negligible response was for “don't know” [Graph 1]. Comparatively, the higher responses for “Never” response according to the dmft scores were from parents of children with dmft = 0. Least “never” responses to questions were from parents whose children had dmft >3 [Graph 2]. The mean child impact score and family impact score was the highest for the group of dmft >3. It was recorded at 11.68 ± 9.12 and 3.94 ± 3.61, respectively [Table 1]. The overall child impact ECOHIS score was 7.54 ± 8.40, and family impact score was 2.50 ± 3.33. There was a statistically significant difference in the child impact ECOHIS score between the three dmft categories [Table 2]. Post hoc analysis shows that there was a significant difference in the scores of children with and without dmft. However, there was no difference between the dmft 1 and 3 and dmft >3 category. Similar finding was observed for the family impact score [Table 3]. OHRQoL is an important measure when the concept of well-being and oral health is considered. It is of great significance since it is not only limited to symptoms or diseases of patient affecting himself but also affecting the quality of life of his family. The mean age of the preschool children in our study was 4.22 ± 0.68 years which was similar to that of the study conducted by Bhat and Sivaram and Jankauskienė et al. Majority of the participants in the present study were boys which were similar to the study reported by Jankauskienė et al. Contrary to the results of this study, majority of the girls participated in a Malaysian study by Hashim et al. Most of the fathers were the respondents in the present study which was not in agreement with the results stated by Bhat and Shivram, Hashim et al., and Jankauskienė et al. The possible reason for this could be due to the fact that in one of the schools very few parents attended the parent teachers meeting and the majority of the questionnaires was then distributed to the parents(father) who had come to drop their child. In the present study, when asked regarding child pain symptom most of the parents suggested that their children never complain about pain. The result of this study for this item was similar to that of the study conducted by Hashim et al. in Malaysian children. Majority of the parents in the present study have suggested that their child never/hardly ever had difficulty in drinking hot or cold beverages due to dental problem which was in accordance with Pahel et al., Hashim et al., and Farsi et al. For the item related to difficulty in eating, the majority of the parents have suggested that their children never had difficulty in eating due to dental problems or treatments; which was also reported by Hashim et al. and Pahel et al. Few parents have reported that their child occasionally or hardly ever complained of pain, difficulty in drinking hot or cold beverages, difficulty in pronunciation, difficulty in eating, missed preschool/school or daycare, has been irritated or frustrated, avoided smiling or laughing or avoided talking due to dental treatments or problems [Graph 1] which was in accordance with the studies conducted by Pahel et al. Hashim et al. and Farsi et al. One striking feature of [Table 2] and [Graph 2] was that even with child's dmft >3 parents have reported “never.” Explanation for more number of “never” responses from parents of children with >dmft 3 score maybe, that the tool (Marathi–ECOHIS) does not specify the time period based on which they have to fill the questionnaire. Hence, the chances are either they considered the present time when the child is not complaining or when the dental visits must have occurred the children would have undergone treatment and was symptom-free. In the present study, most of the parents have suggested that they have never been upset, guilty, or taken time off from work because of their child's dental problems or dental treatments. [Graph 1] which is analogous to that of the study conducted by Pahel et al. and Hashim et al. The result was also similar with Pahel et al. and Hashim et al. study for the item related to financial issue wherein; most of the parents have suggested that they have never had financial impact due to their child's dental problems or treatments. When the children have dmft = 0 ideally, it is expected that the child impact score and parental impact score should have come to 0. However, in the present study, the mean child impact score was 2.03 ± 3.84, and family impact score was 0.72 ± 2.03 with results being similar with Pahel et al. However, in the present study, the post hoc analysis showed that no difference between lower dmft (1 and 3) and higher dmft (>3). This indicates that once the caries is developed the quality of life is affected to the same tune even if it is dmft = 1 or dmft >3. Some confounders may have influenced the study result. For example, the father's participation in the study was more. Mothers have higher emotional quotient and sensitive nature towards their child health and pain. The mother with higher dental anxiety who perceives their child's oral health affects the OHRQL takes the child more to the dentist. Had the mothers also participated in equal number, the family impact score would have been different. In a study among 200 preschool children in Bengaluru, the child impact (11.51) and family impact (5.53) ECOHIS scores were very high as compared to the present study. Here, the study participants were only mothers. The pain or other symptoms are mostly noted by the parents when the children have decayed teeth and they inform their parents about the discomfort. Parents would never by themselves initiate to check the oral cavity of the child in the absence of any pain. One of the major limitations of our study is that we considered dmft i.e., decayed, missing and filled components together as a single dmft score, then made three categories and then compared with the ECOHIS scores. A better option would have been comparing only decayed component and categorizing based on the same which would have given a better picture. Recall bias could have occurred since the scale does not suggest the period for pain (e.g. pain since last 6/12 months), etc. Complexity of the dental treatment procedures also determines variation in the quality of life., In the present study, we did not differentiate the groups based on the treatment procedures, and thus this can be a confounder. Further, studies should be conducted, specifying the time period for which the questionnaire should be filled to eliminate recall bias, both the parents should give their responses to the questionnaire, gender comparison should be done, effect of socioeconomic status should be evaluated and also the complexity of the treatment procedures should be considered for evaluation. The present study concludes that different levels of caries experience impact the quality of life of the children and parents differently. Marathi ECOHIS tool performed well in discriminating among the children with and without dmft. Ventegodt S, Flensborg-Madsen T, Andersen NJ, Merrick J. Which factors determine our quality of life, health and ability? Results from a Danish population sample and the Copenhagen perinatal cohort. J Coll Physicians Surg Pak 2008;18:445-50. Bennadi D, Reddy CV. Oral health related quality of life. J Int Soc Prev Community Dent 2013;3:1-6. Al Shamrany M. Oral health-related quality of life: A broader perspective. East Mediterr Health J 2006;12:894-901. Feldens CA, Giugliani ER, Duncan BB, Drachler Mde L, Vítolo MR. Long-term effectiveness of a nutritional program in reducing early childhood caries: A randomized trial. Community Dent Oral Epidemiol 2010;38:324-32. Jorge KO, Moysés SJ, Ferreira e Ferreira E, Ramos-Jorge ML, de Araújo Zarzar PM. Prevalence and factors associated to dental trauma in infants 1-3 years of age. Dent Traumatol 2009;25:185-9. Robson F, Ramos-Jorge ML, Bendo CB, Vale MP, Paiva SM, Pordeus IA. Prevalence and determining factors of traumatic injuries to primary teeth in preschool children. Dent Traumatol 2009;25:118-22. Masood Y, Masood M, Zainul NN, Araby NB, Hussain SF, Newton T. Impact of malocclusion on oral health related quality of life in young people. Health Qual Life Outcomes 2013;11:25. Tsakos G, Blair YI, Yusuf H, Wright W, Watt RG, Macpherson LM. Developing a new self-reported scale of oral health outcomes for 5-year-old children (SOHO-5). Health Qual Life Outcomes 2012;10:62. Broder HL, McGrath C, Cisneros GJ. Questionnaire development: Face validity and item impact testing of the child oral health impact profile. Community Dent Oral Epidemiol 2007;35 Suppl 1:8-19. Pahel BT, Rozier RG, Slade GD. Parental perceptions of children's oral health: The Early Childhood Oral Health Impact Scale (ECOHIS). Health Qual Life Outcomes 2007;5:6. Hashim AN, Yusof ZY, Esa R. The Malay version of the Early Childhood Oral Health Impact Scale (Malay-ECOHIS) – Assessing validity and reliability. Health Qual Life Outcomes 2015;13:190. Bhat SG, Sivaram R. Psychometric properties of the Malayalam version of ECOHIS. J Indian Soc Pedod Prev Dent 2015;33:234-8. Jankauskienė B, Narbutaitė J, Kubilius R, Gleiznys A. Adaptation and validation of the early childhood oral health impact scale in Lithuania. Stomatologija 2012;14:108-13. Martins-Júnior PA, Ramos-Jorge J, Paiva SM, Marques LS, Ramos-Jorge ML. Validations of the Brazilian version of the early childhood oral health impact scale (ECOHIS). Cad Saude Publica 2012;28:367-74. Peker K, Uysal Ö, Bermek G. Cross-cultural adaptation and preliminary validation of the Turkish version of the early childhood oral health impact scale among 5-6-year-old children. Health Qual Life Outcomes 2011;9:118. Scarpelli AC, Oliveira BH, Tesch FC, Leão AT, Pordeus IA, Paiva SM. Psychometric properties of the brazilian version of the early childhood oral health impact scale (B-ECOHIS). BMC Oral Health 2011;11:19. Jabarifar SE, Golkari A, Ijadi MH, Jafarzadeh M, Khadem P. Validation of a Farsi version of the early childhood oral health impact scale (F-ECOHIS). BMC Oral Health 2010;10:4. Farsi DJ, Farsi NJ, El-Housseiny AA, Damanhouri WH, Farsi NM. Responsiveness of the Arabic version of the ECOHIS to dental rehabilitation under general anaesthesia. Int J Paediatr Dent 2018;28:52-61. Farsi NJ, El-Housseiny AA, Farsi DJ, Farsi NM. Validation of the Arabic version of the early childhood oral health impact scale (ECOHIS). BMC Oral Health 2017;17:60. World Health Organization. Oral Health Surveys Basic Method. 4th ed. Geneva: World Health Organization; 2013. Shruti N, Kakodkar P, Shetiya SH. The early childhood oral health impact scale (ECOHIS-Marathi). J Dent Res Rev 2017;4:114-5. Nemati S, Ghasempour M, Khafri S. Impact of oral and dental health on quality of life in Iranian preschool children and their families. Electron Physician 2016;8:3296-301. Ferreira MC, Ramos-Jorge ML, Marques LS, Ferreira FO. Dental caries and quality of life of preschool children: Discriminant validity of the ECOHIS Braz Oral Res 2017;31:e24. Guedes RS, Ardenghi TM, Emmanuelli B, Piovesan C, Mendes FM. Sensitivity of an oral health-related quality-of-life questionnaire in detecting oral health impairment in preschool children. Int J Paediatr Dent 2018;28:207-16. 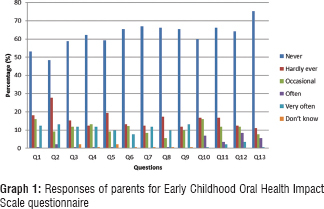 Murali K, Shanmugam S. Influence of mothers' dental anxiety and perception of child's OHRQoL towards utilization of dental services – A questionnaire study. J Indian Assoc Public Health Dent 2017;15:17-22. James JM, Puranik MP, Sowmya KR. Mothers' sense of coherence as a predictor of oral health related quality of life among preschool children: A cross-sectional study. J Indian Assoc Public Health Dent 2017;15:11-6. Vollú AL, da Costa MD, Maia LC, Fonseca-Gonçalves A. Evaluation of oral health-related quality of life to assess dental treatment in preschool children with early childhood caries: A Preliminary study. J Clin Pediatr Dent 2018;42:37-44. Novaes TF, Pontes LR, Freitas JG, Acosta CP, Andrade KC, Guedes RS, et al. Responsiveness of the early childhood oral health impact scale (ECOHIS) is related to dental treatment complexity. Health Qual Life Outcomes 2017;15:182.